What Is Tendonitis of the wrist ? Tendonitis of the wrist is an irritation and swelling of the tissue or 'tunnel' which surrounds the tendons of the thumb. Pain in the front of the wrist is a common symptom of tendonitis. Bending and extending the wrist is usually painfulh; there may be swelling in the wrist. If the hand is made into a fist with the thumb tucked inside and the pain gets worse the diagnosis is likely tendonitis. Tendonitis of the wrist can be caused by biomechanical problems, injury to the arm, overuse, poor equipment and overuse. 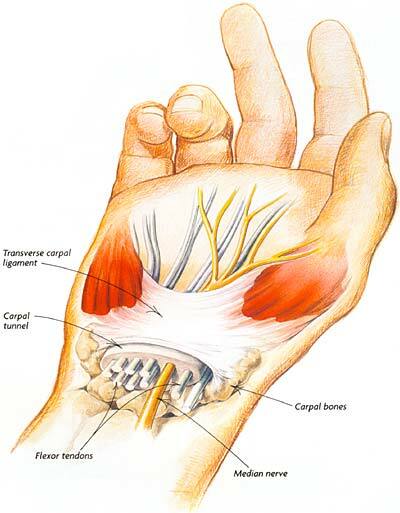 Inflammation of the wrist tendons happens often when someone starts a new activity or exercise. If treated early, tendonitis can improve quickly. Steroid injection or anti-inflammatory medications can be used in most cases. More serious tendonitis may require surgery. If you experience symptoms, the first thing to do is to alter the activities which caused the symptoms and let the wrists rest and recover.